Our new mobile app makes installation simpler and faster, saving you time and money. 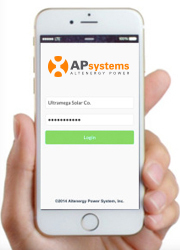 The ArrayApp mobile application allows the installer to map your PV array and complete the APsystems microinverter registration process from the field through their mobile device. Serial numbers on each microinverter unit are scanned using a wireless barcode reader or camera, and entered into the Blue Frog customer database for warranty and support. ArrayApp is available for both iPhone and iPad through the Apple iTunes App Store. The app requires iOS 7.0 or later, and offers English, German and simplified Chinese language support. The Android version is available for download through the Google Play Store. 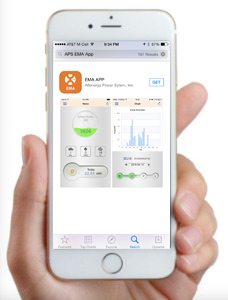 The Energy Monitoring and Analysis App allows APsystems microinverter system owners to track solar array performance in real time through their iOS mobile device. See system output by day, month, year and lifetime of the array, and calculate energy savings based on price per kilowatt hour. The app also displays environmental savings in gallons of gasoline, trees and carbon emissions. All data is displayed through an easy-to-use graphical interface.